This study has 7 sessions, incorporating an introductory session and 6 lessons. The Study Set includes the Study Guide by Little Rock Scripture Study Staff and the New Collegeville Bible Commentary, First and Second Corinthians by Maria A. Pascuzzi (Liturgical Press). Note that the First Corinthians study and the Second Corinthians study use the same commentary. Those planning to do both studies should order Study Sets for one of the studies, and order only the study guide for the subsequent study. Maria A. Pascuzzi, CSJ, STD, teaches Scripture at the University of San Diego. She has a Liscentiate in Sacred Scripture from the Pontifical Biblical Institute and her Doctorate in Sacred Theology is from the Gregorian University. Come to know the forceful but loving character of Paul, one of the best known figures in the early Church. No other letter from Paul is so revealing of Paul's personality. Paul likens the ministry of Apostles as that of being ambassadors of God whose message is one of reconciliation. Arguing from his own experience of discipleship and ministry, Paul continues to promote unity in a divided and confused Corinth by reflecting on his own weaknesses as an opportunity to find strength in Christ. He calls the Corinthians to generosity in care for the poor who live outside their own community. 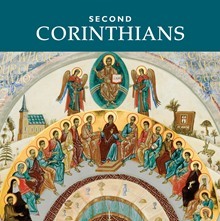 These lectures correspond to the seven sessions outlined in the Study Set for Second Corinthians.